As EBC’s flagship street brake pad material for prestige and faster cars above 200BHP, the 09 version of EBC Redstuff ceramic Brake pads sets new standards in brake performance. Redstuff ceramic brake pads have always been known for its low dust ability but the latest blend has greatly reduced the phenomenon of pad “Pick up” or disc scoring and reduced dust even further. Tested at the UK Motor Industries Research Association (MIRA) in witnessed tests early Redstuff reduced car stopping distance in tests by almost 50 feet from 100 MPH offering a staggering 30% brake improvement. 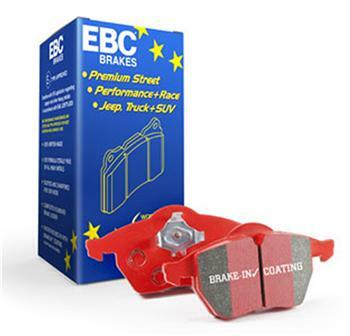 EBC lowest dust fast street pad with 20-25% % brake improvement.